1 Mint sprig, for garnish. Boxcutters, Jigger, Shaker Classic/Boston, Citrus Juicer, Strainer, Beer Glass. Fill a cocktail shaker halfway full with crushed ice. 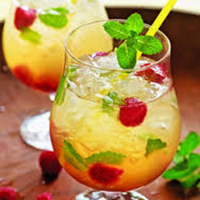 Add the mint leaves, raspberries, tequila, Strega, and lemon juice. Shake really well. Dump the contents of the shaker (no straining here) into a large tulip-style beer glass or other good-sized pretty vessel. Fill the glass with crushed ice, garnish with the mint sprig, and serve with a straw.